Sygic Car Navigation is specially optimized to work with your car's built-in infotainment system and is compatible with different car manufacturers*. To get world-class navigation on your car dashboard, simply download the Sygic Car Navigation app to your iPhone and connect it via USB cable to your car's in-dash infotainment system. Learn more about how it works. For the first 7 days, you can enjoy all the premium features such as car connectivity, turn-by-turn navigation with voice instructions, speed limit warnings, junction views and lane assistant. After 7 days you can either buy a premium lifetime license with car connectivity for 79.99 € or pick up a premium, smartphone-only lifetime license for 29.99 €. After the trial period you can still use the app for free with its basic features. The Live Services include the combined power of Live Traffic Information and the Speed Camera database in one great product at an even lower price. With Live Services you can find the quickest route to your desired destination based on current road conditions. 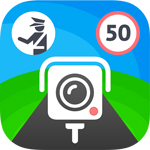 Up-to-the-minute information from the world's largest online speed camera database will help users to be safer on the road and avoid costly tickets. Live Services are now available in Sygic Car Navigation for 19.99 € per year.